WhatsApp and plenty of other instant messaging apps such Facebook, Telegram, Line, Skype, and others are increasingly has become the essential part of IT business organizations. All of the technological creatures in the shape of social messaging apps have the great piece of influence on the corporate sector no time ever before. Bosses and employees are using these instant messengers for business purposes and get ultimate advantages, because these are, efficient, accurate, with user-friendly interface and far faster than email and enhance the communication process at a workplace and increase the productivity. On the other hands, WhatsApp has devastating effects with regard to uses cases, data security, administration, ecosystem integration, and support. Let’s describe how it is logical and to the point. WhatsApp business app usually stores the address book of employees; it may have the secret documents in the shape of customer data or company’s confidential reports. However, WhatsApp has introduced encryption, but even then previously potential attackers have exploited WhatsApp flaws and user’s encrypted chats. But the messenger does have announced enterprise-grade encryption for i.e metadata, storage on the gadgets and devices and last but not the least storage on the servers. Moreover, the social media apps are a free online service that needs to require user data to make a living. WhatsApp further has announced to make revenue through business allowing people to communicate with the customers. However such type of business model needs to have complete information of users in conflict with the minimal use of personal data, general data reduction and last but not the least complete data protection. The absence of data security laws and the maximum surveillance in the US, the entire cloud services are based in the US don’t make sure for significantly data protection is needed for the business enterprises and for employees and customers. However, it is related to the European based business companies that follow European laws and get strong data protection for the business and for customers as well. Therefore, uncontrolled WhatsApp data security at a workplace may ruin the business and become the possibility of data breaching, cyberslacking, and phishing attacks. WhatsApp users can do messages, chat conversations, shared business documents, audio and video conversations and last but not the least sent or received Voice messages. However, when it comes to business-related activities through all above mentioned WhatsApp instant messaging tools the business and private communication must be separated. Firstly, an instant messenger that is dedicated to business enterprise empower quick access and provide a better view of all the things that are subjected to the internal communication, and it finally improves the productivity. Secondly, the business has confidential content is secured through dedicated business messaging apps, because it is restricted to the use of employees and employers only and the content sharing is under the control of the company. So, the business world has to be used such a communication tool that doesn’t mix the private and business communication in a single account. Every business needs to managed professionally, having the administration control panel help out for easy roll out, transparent employee monitoring, communication policies of the company, user management, pre-configured devices monitored through cell phone and computer spying apps in order to protect the stored data within having a complete data backup, managed groups, fast support and many more. However, WhatsApp is used in the business enterprise lacks with all above-mentioned necessities. There is no prevention of data loss in someone has lost the cell phone or broken down of the devices and stolen. The business data demands a protection layer to protect the stored data. However, data backup and cell phone monitoring apps are available that provides complete data protection having the user owned online control panel that empower the users to get back all of the data in-case the device has been stolen, breakdown or lost. However, the cell phone surveillance software also provides remote wipe out data option. On the other hand, instant messenger WhatsApp doesn’t provide such security measures at all for the people who are using it for business reasons. Apart from the cell phone and tablets users, there are plenty of workers in the corporate sector that uses windows laptops computers and MAC machines. On the other hand, professional desktop version for windows and MAC computer machines and tablet versions of iOS and Android and Windows phone are the essential elements of complete messaging solutions. Because, desktop and tablets version of a company’s messaging apps improves the use cases, enhance usability, decline the email burden, improve the team communication and also improves the desktop productivity. However, the instant messenger needs to be connected to the cell phone to work properly on the desktop device that may lead a user to swear security risks. In the business organizations employees uses enterprise-grade file sharing solutions such as Microsoft SharePoint, Box, Business connector and plenty of others alike. On the other hand, WhatsApp is not supported all of these things, and the file sharing such as company’s owned secrets is the normal activity in the business companies and they share direct files through enterprise messaging app. But sharing company’s related confidential files could be risky and it is also possible that black hate hacker and scammers stole the business secrets. Furthermore, cyber ransomware attacks are the on the rise and the world security has fallen once for a while in the past. There are many business-related people in the world that are aware of the fact that “WhatsApp for the enterprise” for the inter-company communication. On the other side, there are few who know the importance of the integration of a messaging app with the IT ecosystem. It is one of the most important components of the enterprise messaging app. But WhatsApp does not have all the stuff that accelerates operational execution and the productivity with an integration of manufacturing and logistics system to the business enterprise messaging. 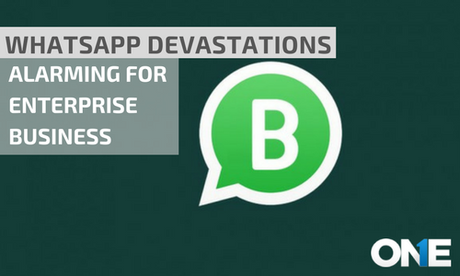 WhatsApp has all above devastating effects on your business enterprise and you may lose your company’s owned confidential data. Furthermore, a couple of mistakes made by your employees on WhatsApp and leads your shared files to the scammers, hackers and to cyber-attacks. However, you can manage the solution with TheOneSpy WhatsApp spy app to create your own data back and sync all of your data to the online control panel of the WhatsApp monitoring software. Furthermore, a user can keep an eye on Their Whatsapp activities such as view WhatsApp logs such as chat conversations, shared media files, audio, and video conversations and sent or received Voice messages.